It&apos;s not going to be a season of gold-rush proportions, but after a couple of slow years, it looks like a substantial number of boats will be heading north along the Inside Passage to Southeast Alaska this year. Two seasons back, the punitive price of diesel fuel kept many boaters close to home. Last year, the sickened international economy was the wet blanket. But this year it seems that a growing number of boaters are willing to invest the time—two or three months—and the cash required to run their craft 2,000 miles or more in a round-trip along the Inside Passage. The early birds are under way now, happy to be moving north, even though lingering winter storms may keep them hiding on the hook for days. These experienced Inside Passage cruisers are smart enough to seek refuge from bluster in harbors rich in oysters, clams, and Dungeness crab. Many others will depart later this month, and all but the fastest boats probably will be at sea by the end of May. That means there&apos;s a lot of getting ready going on. I know, because I plan to head north in my 31-year-old 42 Grand Banks near mid-May, and it&apos;s been a hectic winter for me. For all of us it has meant months of attention to our boats, replacing or upgrading equipment, checking every system and stockpiling parts, charts, and books, taking shakedown cruises, and getting together to talk about going to Alaska. It&apos;s work, but fun. Getting there is an exciting and challenging trip. Ketchikan is 700 miles more-or-less north of Seattle. Juneau and Glacier Bay will make it more than 900 miles. Boaters who depart the "interstate" sections of the Inside Passage and explore inlets, fjords, and clusters of small and rugged islands lying offshore will add hundreds of additional miles and reap huge dividends from exploring those wilderness areas. A number of meetings—at yacht clubs, gatherings sponsored by builders or by guidebook publishers—suggested there&apos;s a renewed interest in Alaska as a destination this year. My first hint came through the Fidalgo Yacht Club in Anacortes (of which I am a member). There was a lot of talk about going to Alaska early in the winter, so we called a meeting. Attendance totaled 27 (club membership is less than 100), and I expect that about eight club boats will make the trip this year. That&apos;s huge. I sought confirmation by turning to a boating friend, Linda Lewis, a 100-ton USCG-licensed skipper who teaches boat handling, boat systems, and navigation and lectures on many boating topics. She appears frequently at PassageMaker&apos;s Trawler Fest programs and recently lectured at a seminar sponsored by Fine Edge Publications, which produces cruising guides for the West Coast (including Alaska and British Columbia) and the Virgin Islands. She also shared her knowledge with members of the Seattle Yacht Club. "I&apos;m seeing a dramatic increase in cruisers who say they are heading to Southeast Alaska, and their excitement is palpable," she told me. "People are attending seminars, preparing their boats, and taking private instruction to gain boat-handling skills. It seems that after several quiet seasons of collecting information and dreaming of the big trip, this is the year to do it." Linda and her husband, David Parker, are regulars on the Inside Passage. They know the main route well and all the fascinating lesser-known places—and they enjoy talking about it all. Seeking additional support for my views, I called on Mark Bunzel, a neighbor in Anacortes who publishes the Fine Edge guides and sponsored a spring seminar at which Linda and others spoke. A boat owner, he is hard-wired into the boating industry and has made the run to Alaska. He agreed with my observations. "We definitely have seen an increase this year in those planning to travel the Inside Passage to Southeast Alaska, based on the sale of our cruising guides, planning maps, and attendance in our cruising seminars," Mark told me. "We have people who are local to the Seattle area, as well as those coming from different parts of the country, who have put off a trip in the last couple of years due to the economy or other concerns. 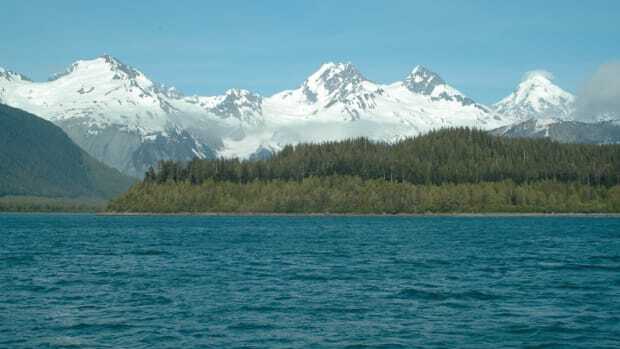 "They know that Southeast Alaska is one of the premier boating destinations. Fuel prices are better than two years ago. Many realize they are not getting any younger and know Southeast Alaska should be explored in three or four successive annual trips. I expect it will be a very good year in Southeast Alaska." I also talked with folks at Armchair Sailor in Seattle, a major distributor of charts, cruising guides and a huge assortment of boating publications. Sales of Alaska charts and guide books are up three times over last year&apos;s dismal season. However good that may sound, Alaska-related business this year is only about half of what it was before our economy stalled, they said.. That&apos;s just to keep things in context. The ongoing informal gatherings at yacht clubs and among cruising friends deal with important issues, from cell phone and wi-fi connections to insurance requirements, fuel availability, customs and immigration requirements, understanding weather conditions, and how to get weather information—just to name a few. My experience with a group that included experienced Alaska hands and wannabes is that there always are good questions and usually good answers. We all left better informed. For some, the British Columbia coast from Cape Caution to the U.S. border is equal in quality to cruising in Alaska. Generally, I agree. British Columbia has spectacular mountains rising from the mainland and coastal islands. Huge waterfalls plunge into the sea. It has secure anchorages and superb fishing. But it doesn&apos;t have glaciers or floating ice or the frontier ambience of Southeast Alaska. Both are great places, and even if you don&apos;t cross that northern border into Alaska, you&apos;ll still have had a rewarding cruise. Not everyone wants to go to Alaska in a small boat. That&apos;s good for those of us who savor the trip. Some don&apos;t have the time, while others are concerned about the major open crossings—Dixon Entrance and Queen Charlotte Sound, which are open to the Pacific Ocean—and the somewhat less intimidating interior channels, such as Georgia Strait, Johnstone Strait, and Queen Charlotte Strait. I have been chased from all of them by weather. There&apos;s no shame in turning back for a comfortable hiding place. The important thing is always to have a secure harbor in mind. Have a Plan B, just in case. And carry good books, table games, and DVDs. For some, issues more difficult than sea conditions are close to home and must be resolved before casting off. They include dealing with mail, paying bills, finding someone to watch the house and to care for pets that don&apos;t go to sea. Others worry about leaving older family members alone. Finding a reliable house sitter can be difficult. Here&apos;s a hint: Realtors often have clients with no place to live after selling one house and before buying another who would welcome a short stay in a house temporarily left vacant by a cruising family. "Cruising to Southeast Alaska is challenging, stimulating, and enjoyable. It is not intimidating or frightening. "Although the scenery is intoxicating, the fishing superb, and the people congenial, the greatest reward from cruising the Inside Passage to Southeast Alaska is cerebral—it is the overwhelming sense of accomplishment that comes with completing a journey into unknown waters."